A lucrative and active human smuggling ring brought an undetermined number of potential Somali jihadists into the United States through Brazil, federal prosecutors say in court papers. Those prosecutors are asking a federal judge in San Antonio to give the maximum sentence to a Somali man who pleaded guilty in November to two counts of making false statements on a 2008 asylum application. Ahmed Muhammed Dhakane failed to report his connections to Al-Ittihad Al-Islami (AIAI) and al-Barakat, both specially designated terrorist organizations. When he is sentenced April 28, prosecutors want U.S. District Judge Xavier Rodriguez to factor in a series of related and disturbing actions spelled out in this memorandum, including the human smuggling of potential terrorists. They intend to call several law enforcement witnesses and three people Dhakane smuggled into the country. The smuggling was run through Brazil, aided by bribes paid to immigration authorities there, from June 2006 through March 2008. Dhakane instructed those he smuggled on how to make false asylum claims. The sentencing memo was first reported by Patrick Poole. In it, prosecutors say that a confidential informant will testify that Dhakane openly talked about being a member of the AIAI. Dhakane sees that group and other designated Somali terrorist groups such as al-Shabaab and the Council of Islamic Courts (CIC) as one entity because of overlapping membership. The only distinction, he said, was between "supporters or fighters," but "all of these individuals are ready to fight and die for the cause." Some of the people Dhakane smuggled into the United States were AIAI members. "Dhakane stated he did not know their exact reason for wanting to enter the United States, but cautioned that he believed they would fight against the US if the jihad moved from overseas locations to the US mainland," the memo said. Dhakane "bragged on tape to the [informant] that he made as much as $75,000 in one day by smuggling Somalis. On tape, Dhakane stated his minimum charge for smuggling individuals was $3,000 per person," prosecutors wrote. Dhakane smuggled in people he knew were violent jihadists "with the full knowledge that if the decision was made by the [terrorist group], for which he was associated with in the past, to commit terrorist acts in the United States, these jihadists would commit violent acts in and against the United States," they added. Concerns over Somalis and terrorism have focused on activity in the opposite direction during the past two years. More than 20 young Somalis from the Minneapolis area are believed to have returned to East Africa to join al-Shabaab's jihad. Several of them have been killed. 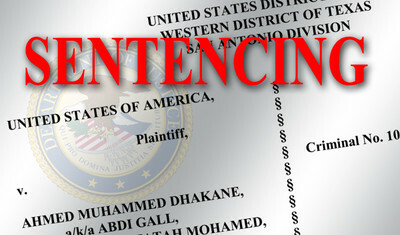 In addition, more than 20 people have been indicted throughout the country on charges related to recruiting Somali fighters. One American, Omar Hammami, is considered an al-Shabaab leader. But reports indicate FBI officials are focused on possible domestic threats from Somalis. The terrorism enhancement isn't the only reason prosecutors want Dhakane to receive the maximum 10-year sentence on each count – and to have those sentences run consecutively rather than the normal concurrent term, extending his time in prison to 20 years. In admitting his guilt, Dhakane lied to the court by denying he was an alien smuggler. In addition, Dhakane repeatedly raped and impregnated an underage girl who he was paid to smuggle into the United States. When he applied for asylum, Dhakane claimed the girl was his wife, thinking it would help his asylum chances to have a pregnant wife. She told officials he threatened to kill her if she denied this or mentioned the rapes. Prosecutors say that qualifies him for sentencing enhancements for using a minor who was vulnerable in advancing his crimes. The girl now suffers with Post Traumatic Stress Disorder. There also is a public safety concern that makes a longer sentence necessary. Though he is ordered to be removed from the country, he may one day be set free in the United States "because of the lack of a functioning government" in Somalia, prosecutors wrote. A witness from the Department of Homeland Security is expected to testify about that at the sentencing hearing. As Poole reports, this is not an isolated example of terrorists trying to sneak into the United States. In one case, a Hizballah operative crossed the border with Mexico in the trunk of a car.